View the CAAFI brochure: an overview of CAAFI’s background, goals, and accomplishments. 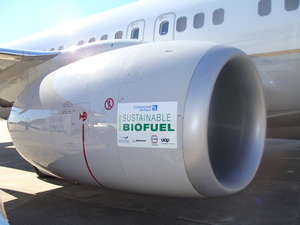 Since 2006, the Commercial Aviation Alternative Fuels Initiative (CAAFI) has sought to enhance energy security and environmental sustainability for aviation through the use of alternative jet fuels. CAAFI is a coalition of airlines, aircraft and engine manufacturers, energy producers, researchers, international participants and U.S. government agencies. Together these stakeholders are leading the development and deployment of alternative jet fuels for commercial aviation. CAAFI’s goal is to promote the development of alternative jet fuel options that offer equivalent safety and favorable costs compared with petroleum based jet fuel, while offering environmental improvement and energy supply security for aviation. The volatility in petroleum prices caused fuel to become the single largest component of U.S. airline operating costs for the first time in history in 2006. And, concern about the environmental impacts of aviation growth is also rising within the international community. While U.S. commercial aviation consumes about 3 percent of U.S. total energy use, it drives about 6 percent of the U.S. gross domestic product and just under 9 percent of national employment. Secure and sustainable fuel sources are essential for its continued prosperity to the benefit of the American people. Aviation is international in scope, highly integrated in its fuel supply chain and, because of a significant ability to align and coordinate within the industry, well positioned to pursue alternative fuels. To ensure the safety of any alternative fuels given the demanding environment posed by aviation operations, participants are creating a new jet fuels approval process via the ASTM International standard setting body. Fuel approval will enable the safe use of alternative jet fuels and guarantee manufacturer, user, and regulatory confidence in them. To improve understanding of the broad range of new fuel production technologies and feedstocks that can be applied to aviation, participants are sharing analyses and identifying and coordinating research activities. To ensure that relevant environmental, social, and economic risks and performance metrics are understood and given consideration at every stage of alternative jet fuel development, evaluation, and deployment. To facilitate the deployment of alternative jet fuels in the marketplace, participants are connecting fuel producers and consumers, evaluating the business case for use of alternative jet fuel, and identifying opportunities for deployment. CAAFI members meet regularly to share updates on the state of alternative jet fuel developments, identify gaps and challenges, and determine next steps in the research, development, and deployment process. CAAFI is an acronym for the Commercial Aviation Alternative Fuels Initiative. CAAFI is a coalition of aviation stakeholders who are interested in bringing commercially viable, sustainable, alternative jet fuels to the marketplace. CAAFI is engaged in various activities to enable and facilitate the near term development and commercialization of such fuels. Who are CAAFI’s stakeholders (sponsors and participants)? Why and how was CAAFI formed? CAAFI was formed in 2006 in response to three concerns regarding aviation fuels: 1) supply security, 2) affordability and price stability, and 3) environmental impacts. These concerns prompted the FAA Office of Environment and Energy R&D Advisory Board to request action on aviation alternative fuels from the FAA Office of Environment and Energy. Following initial presentations by the manufacturing sector and the U.S. Air Force at a Transportation Research Board (TRB) forum in January 2006, FAA, A4A, and AIA elected to form a coalition of interested parties to foster alternative jet fuel development, later formalized as CAAFI; ACI-NA joined shortly thereafter. CAAFI functions in several ways. It serves a primary role as a clearinghouse, facilitating the exchange of information about, and coordination of, private-sector and governmental initiatives supporting the development and commercialization of “drop-in” alternative aviation fuels (i.e., fuels that can directly supplement or replace petroleum-derived jet fuels). CAAFI members execute on in-kind work programs, while CAAFI sponsors (and their members) and other public-private partners provide resources for the execution of various work elements. CAAFI often serves as an industry voice that communicates progress and the need for the execution of a very broad range of efforts by the entire jet-powered aviation enterprise. What is the long-term goal of CAAFI? CAAFI aims to facilitate the development and deployment of alternative jet fuels that will significantly reduce emissions associated with aviation operations in commercially meaningful quantities while improving price stability and supply security. The availability of fuels produced from renewable feedstocks and/or other waste-streams will help operators reduce aviation's net carbon footprint, even as aviation activity increases. What does CAAFI believe are the prospects for alternative aviation fuels? CAAFI is confident that sustainable alternative jet fuel derived from several feedstocks will be commercially available in the next one to five years and is working with other stakeholders to enable various industry goals (including the commitment of the commercial airlines and States to achieve net carbon neutral growth in international aviation from 2020 onward). The types and volumes of alternative fuels reaching the marketplace will depend on many factors, including the extent of governmental support (R&D and policy), new technological developments, and investor interest. CAAFI is both feedstock- and technology-neutral; that is, it does not support specific technologies or feedstocks to the exclusion of others, but rather seeks to facilitate conditions in which alternative fuels can thrive and compete openly within the bounds set by policymakers and the marketplace. CAAFI has an Executive Director who acts as an overall coordinator and instigator for the work of CAAFI. The Executive Director is supported in his execution of CAAFI work programs by an Executive Director Emeritus, Assistant Director, and an Administrative Leadership Team, which includes a Head Advisor for Strategy and Implementation (FAA) and a Head Advisor for Research & Technical (Volpe) and other support team members. Visit our Leadership page for information on the current CAAFI leadership team. Membership: CAAFI is ultimately a cooperative initiative, a public private partnership comprised of individuals and/or entities who are interested in supporting and engaging in the work of CAAFI. There is no cost to becoming a CAAFI member. CAAFI Work Teams: The Work Teams are led by volunteers from the CAAFI membership who are approved by the Sponsors and Executive Director. At present, there are four Work Teams: Research and Development, Certification/Qualification, Sustainability, and Business. The CAAFI Steering Group (SG) guides CAAFI’s overall strategy and efforts. The Steering Group is comprised of CAAFI’s Leadership, Sponsor representatives, and leaders of the CAAFI Work Teams. What has CAAFI accomplished to date? Fuel Specification Approvals. The CAAFI certification and qualification team works within established processes to help move promising alternative aviation fuels through industry evaluation to approval by ASTM International and other recognized certifying bodies. Government agencies, fuel manufacturers, aircraft and engine manufacturers, and airlines are stakeholders in CAAFI, and many participate on the certification team. The industry has agreed that these alternative fuels should “drop-in” to commercial engines, pipelines, fuel farms, and all other distribution and storage channels, thus requiring no new equipment or infrastructure. With assistance from the CAAFI Certification and Qualification Team, drop-in alternative jet fuels have already been certified for commercial use (more detail below). Fuel & Feedstock Readiness Tools. CAAFI has developed a collection of tools that facilitate assessment and advancement of fuel and feedstock readiness with respect to ASTM approval, R&D and deployment activities, environmental sustainability, and commercialization. See the caafi.org Fuel Readiness Tools page. Stakeholder coordination and communication. 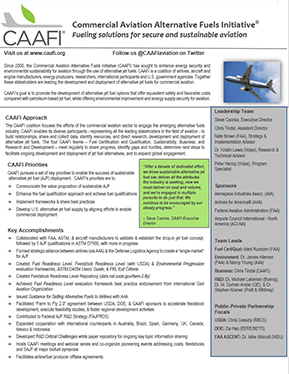 CAAFI enhances communication among government agencies, aviation sector trade associations, industry, fuel producers, feedstock producers, academic researchers, and non-governmental organizations via the CAAFI Biennial General Meeting and team meetings, Global Exchange with other public-private partnerships around the globe, webinars, conference presentations, and other venues. Strategic thought leadership. CAAFI participates domestically with interagency working groups and strategic initiatives (e.g., Federal Alternative Jet Fuel Strategy, Biomass Research and Development Board, Billion Ton Bioeconomy), collaborative forums, alternative jet fuel research consortia (e.g., Aviation Sustainability Center (ASCENT)). State Initiatives. CAAFI works to facilitate formation of supply chains for alternative jet fuel deployment through state and regional efforts. How does CAAFI interact with the other global alternative aviation fuel coalitions? CAAFI collaborates with alternative aviation coalitions across the globe. CAAFI initiated an ongoing “global exchange” of ideas to facilitate complementary work programs and help aviation present a united framework to facilitate development and deployment of advanced alternative jet fuels. The various organizations working to advance alternative jet fuels understand that fuel production and commercialization will be an effort requiring support from various stakeholders and entities. What is the focus of current CAAFI activity? CAAFI supports the development and deployment of sustainable alternative jet fuels for use by the commercial aviation community via the following objectives. Communicate the economic, social, and environmental benefits of SAJF to the federal government, non-governmental organizations, the private sector, and the public to broaden the base of stakeholders who can continue to enable active investment in the development, demonstration, deployment, and commercialization of SAJF. Promote the use of the D4054 Clearinghouse to enable a broadly-supported, streamlined certification/qualification program. Leveraging new, shared funding and staffing approaches, improved methods, and enhanced specification requirements, CAAFI intends to foster a more durable, higher capacity process to handle the significant queue of potential SAJF candidates. Continue to develop tools to evaluate the technical readiness of feedstocks and fuels, and commercial readiness of producers to identify prime targets of opportunity for sustainable near term supply. Focus on real-world implementation by supporting project development under Farm to Fly 2.0, leveraging the capabilities of the FAA-sponsored Aviation Sustainability CENTer (ASCENT), fostering producer-buyer engagement leading to offtake agreements, supporting the execution USDA-funded projects, and pursuing other initiatives to enable supply chain development and facilitate commercialization of SAJF. CAAFI will continually reach out to additional stakeholders, forge new partnerships, and leverage the interest and resources of current partners to align efforts that build upon the Federal Alternative Jet Fuels R&D Strategy. When should we expect to see alternative fuels in commercial production? Commercial production commenced in the U.S. starting in 2016 with AltAir providing alternative jet fuel to United Airlines at Los Angeles International Airport. In the U.S., CAAFI hopes to see more facilities come online and greater production and use in the coming years, including the Defense Production Act (DPA) awardees. Alternative aviation fuel pathways have already been approved for use in commercial aviation, and additional advanced fuel pathways are undergoing evaluation for ASTM qualification and are likely to come online in the next few years as production capacity challenges are addressed. For more information on fuel qualification, visit our Fuel Qualification page.